The gold and enamel ring was made by Charles Rawlings, of London, after Byron’s death in 1824. 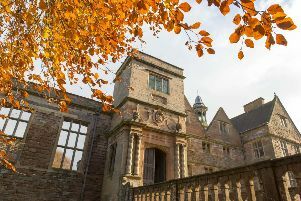 It comes, reputedly, from the contents of Newstead Abbey, the poet’s ancestral home, which Byron sold to his old school friend, Colonel Thomas Wildman, in 1818. Wildman subsequntly sold the abbey to William Frederick Webb in 1861. The ring is one of only three known examples of Lord Byron memorial rings of this type, and is to be sold at the summer fine art sale of Tennants Auctioneers in Leyburn, north Yorkshire on Saturday, July 21. It has an estimate of £3,000 to £5,000. Composed of 18-carat gold, the ring contains three separate inscriptions or engravings, which read ‘Byron’, ‘In Memory Of’ and ‘Died 19 April 1824, aged 36’.